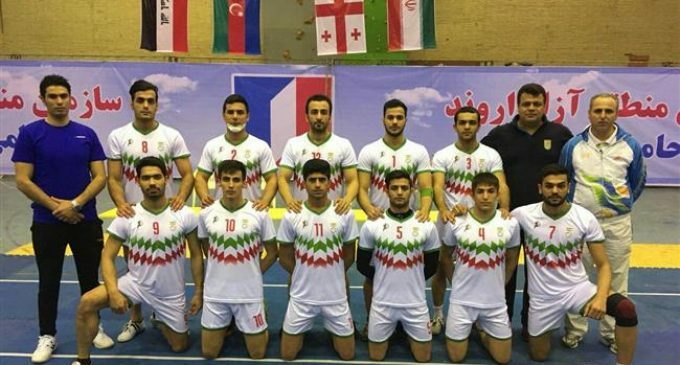 Iran men’s national kabaddi team has stood proudly at the top of the podium at the end of the second edition of Fajr International Kabaddi Tournament, which was held in commemoration of the 39th anniversary of the victory of the 1979 Islamic Revolution that put an end to the monarchy of the US-backed Pahlavi regime in the country. On Friday evening, the Iranian sportsmen defeated the Iraqi side 43-15 in the final showdown at Khalij-e Fars Hall of Shahid Jahan Ara Sports Complex in Iran's southwestern port city of Khorramshahr, situated more than 1,000 kilometers (621 miles) southwest of the capital, Tehran, and picked up the trophy. The second edition of Fajr International Kabaddi Tournament started on February 22, and finished the following day. The tournament brought together Iran men’s national team, in addition to Azerbaijan, Georgia and Iraq national squads. Shahrdari Khorramshahr and Javan Arvand kabaddi teams also took part in the event. Kabaddi is the national game of Bangladesh and also the state game of the Indian states of Tamil Nadu, Maharashtra, Bihar, Andhra Pradesh, Telangana and Punjab. India has the most successful kabaddi team on the world stage, having won every world cup and Asian games title so far, in both men’s and women’s categories.